That's odd. I just did a quick test in PDR17 using the Samsung Gear360 sample clip. Produced to 3840x1920 in a 360 project - uploaded to Vimeo which immediately recognised it as 360, stating "360 detected" after upload was complete. It plays correctly as a 360 file. When you go to the Produce module, do the options look like this? Did you designate the project as 360? I only ask because there are some properties of your produced file that aren't consistent with mine, aside from the obvious PAL/NTSC thing. Thanks for getting in touch, and sorry for the trouble with your video. You will need to toggle the 360 setting on for your video. The option to mark your video as 360 can be found under the Distribution > Discovery page of your video settings. I found your blog and saw your explanation of how to set up a new 5.7K profile. I'm very impressed that you could do it but I don't think I'm going to do it because I'd probably mess it up. It would be nice if Cyberlink incorporated something like that in its next upgrade. Quote ... how to set up a new 5.7K profile. I'm very impressed that you could do it but I don't think I'm going to do it because I'd probably mess it up. There is a 5.2k profile already built at the bottom of this post, and all you'd need to do is change the resolution values and the name to put it to use. Instructions are in that same post, if needed. Thanks to both of you for your advice- but I suspect my elderly somewhat damaged brain would have trouble with creating a profile even with your excellent directions. I just hope Cyberlink will do it for us in their next upgrade of V17. By the way, I tried uploading a 360 deg file to YouTube only to find out it doesn't automatically recognize 360 files- the way Vimeo does. I'm surprised about this. Their help file gave instructions how to modify the file before uploading- but heck no- I'll stick with vimeo. Now, here's a question. 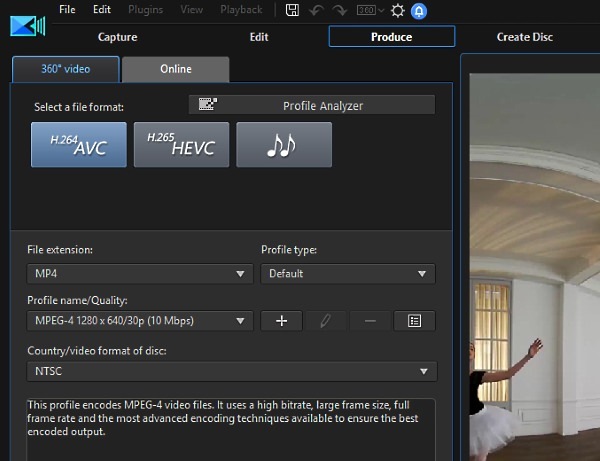 Would uploading a 5.7K or 5.2K 360 deg file to Vimeo look much better than a 4K file? option to sell videos or channel subscriptions for their 360 videos. master the technique of filming in a 360-degree video format. I see that YouTube eventually recognized my 360. After experimenting with uploading 360 videos and "free capture" videos- I see that the quality of the uploaded 360 videos is degraded enough that I'm not happy with them. But the free capture videos I upload are not being degraded much. I'm thinking that there really isn't that many situations that a 360 is going to be useful compared to a carefully developed free capture. I saw your video where you saw up an old oak log. It was 360 but if you had done it as a free capture it would have been just as informative to your audience, perhaps more so as you could "force" their attention where you want- so they don't bother looking around your property. So, even with 5.7 K- that's barely enough to get great quality. It may look decent on your computer but once it's degraded by uploading, it's barely acceptable, to me at least. I notice on the YouTube help site- they recommend uploading much higher resolution 360 videos- I presume with very expensive, multiple lens cameras- such as those Insta360 makes. Regardless, I really love this Insta360 One X camera. It's taking some time to get used to working with editing them. Insta360 recently uploaded their post Beta version of Studio- which is quite nice for a basic 360 editor. Now I need to see what I can do with PD 17. By the way, I enjoyed watching your video of sawing that log. Do you saw much wood? I'm interested because I've been a "professional forester" since 1973. Any photograph and video of anything to do with forests and forest products interests me. That in fact is my objective- to take videos of forestry work. And maybe also in some local sawmills, here in Massachusetts, USA. So, even with 5.7 K- that's barely enough to get great quality. It may look decent on your computer but once it's degraded by uploading, it's barely acceptable, to me at least. 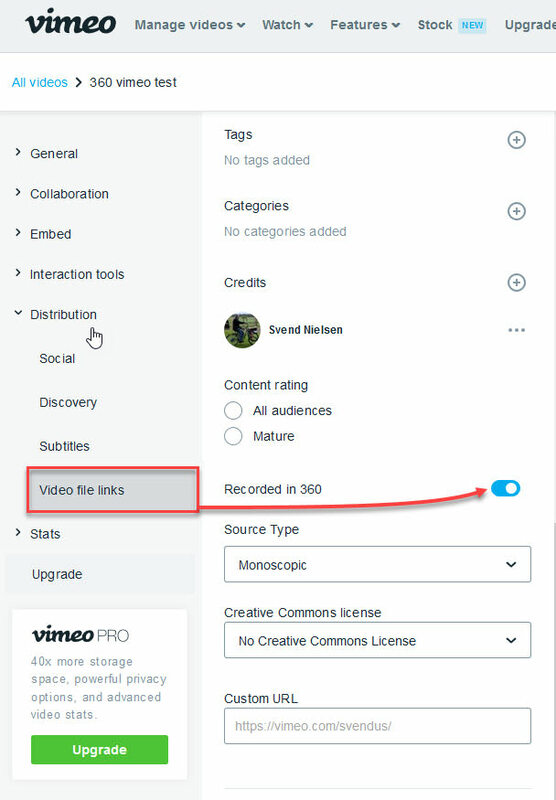 There is no degredation in quality when you upload to YouTube or Vimeo, so it sounds like you're just not getting the full resolution version when you're watching. On YouTube, you should click on the "gear" icon along the lower right edge and make sure you choose the 2160s 4k option. The only problem with setting the res to 4K is that most or many people don't have a fast enough internet service to watch it at that res. What I've concluded is that trying to view an uploaded true 360 is going to be a problem. But producing an "overcapture" from that video will work just fine as it can be produced at a lower res that won't choke many viewers' screens. 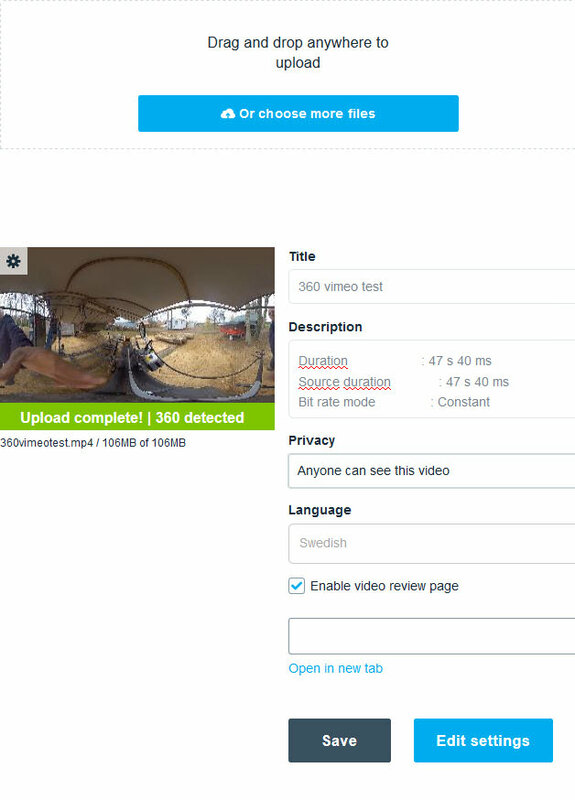 I think I suggested in a response to Sven- that his 360 video didn't add much to his sawing that log compared to- if it was an overcapture at a lower res and focused on the details of the sawing. Then again, I'm a beginner at this 360 stuff so I'm probably wrong. 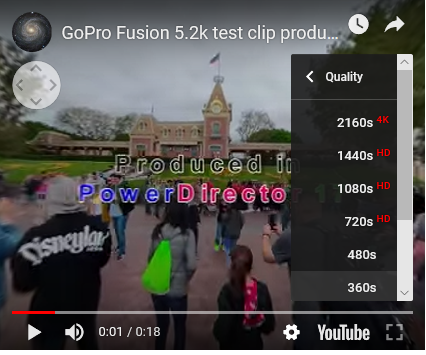 Quote The only problem with setting the res to 4K is that most or many people don't have a fast enough internet service to watch it at that res. You're not wrong, but there is more going on here. One great thing about YT and other streaming sites is that they give the viewer a choice in resolution, so even though I don't have a 4k monitor I can choose to watch in 4k or HD or 480. If the original upload is only in HD, then there's nothing I can do to watch it in 4k no matter what kind of monitor or interent speed I have. 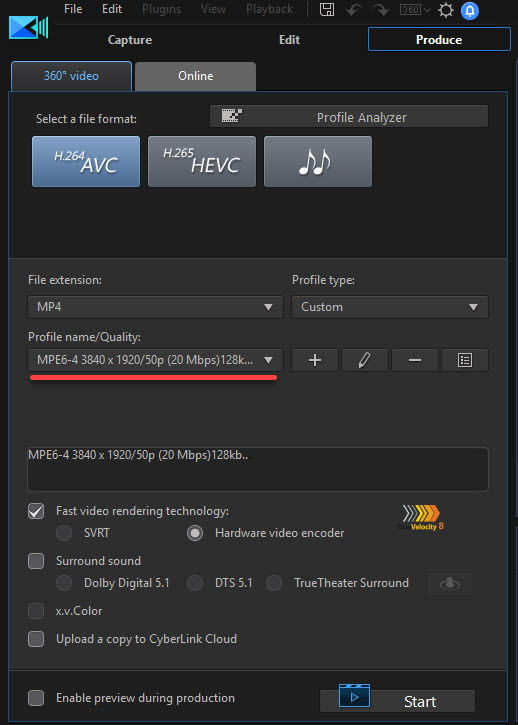 So for online videos in general, I think you should produce at your source clip's native resolution and let the website deal with all the streaming issues. You bring up a good point about recording in 4k or 5.7k and only focusing on a smaller area in HD, but that's really a tool for non-3D videos since you can't "crop out" 3/4 of the sphere and still have an immersable experience. Making a 2D section of just that part in HD would work nicely, though!